Custom Dance Floors, Wall Graphics, Window Graphics, Event Decor & More! Our hand selected group of creative laborers have a “sky’s the limit” mentality and an insightful professionalism to match our extensive industry experience on custom printed vinyl wrap, custom dance floor decals, floor branding, vinyl dance floor wraps, and window graphics. Our expertise as a graphics and printing company has a huge reach with a wide variety of possible applications. From wall graphics to floor vinyl graphics to advanced advertising graphics to custom vinyl dance floor wrap, we’re always happy to accommodate to your specific needs. Bombshell Graphics will provide a consultation to discuss any particular needs or review design options. We are experts when it comes to planning and installing vinyl dance floor wrap, dance floor decals, and more! Plus we never hesitate to jump right in and get a decor printing project started. And if you are in need of wedding or reception related decor, design, and printing based services for your event, we are now proudly featured in The Knot. We offer custom dance floor wedding designs, vinyl wedding floor decals, wedding dance floor stickers, monogram wedding dance floor decal and more. All of our custom dance floor wedding designs are carefully created so that you have an absolutely perfect custom dance floor to share your first dance on as a married couple on your big special day. We specifically create the custom printed vinyl wraps, vinyl floor stickers, and custom floor decals you need to enhance the overall tone of your event. Browse our array of services and options using the image to the left. We can turn the most important day of your life into a magical event by creating amazing space with custom dance floor, custom dance floor wraps, vinyl dance floor wraps, custom dance floor decals, and dance floor monogram decal. 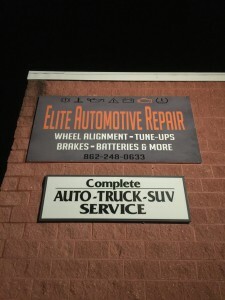 Need last minute services? Pressed by a deadline? You’ve come to the right graphics and decor printing place! We take a lot of pride in providing the best quality results without all the wait. Unexpected printing needs often arise around important deadlines, and here at Bombshell Graphics we make sure our amazing results are only matched by our speedy turnover and quick delivery, ensuring that you receive the important promotional or decorative items you need WHEN you need them. We can help transform your event into the magical day it should be by finishing off the room with a dance floor decal, custom dance floors, personalized floor wraps, vinyl wrapped dance floor, or dance floor stickers for events! 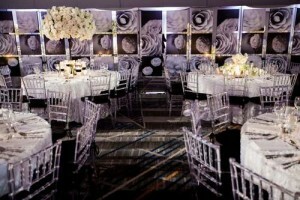 Our all white printed dance floor will create a clean, classy look that makes a multipurpose room your chic new space. 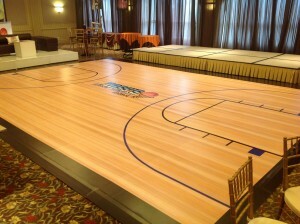 And if you want to be bold, we can create a design or enlarge your image to the entire size of the custom dance floor. There are a number of phenomenal looks for custom dance floors. Whether you prefer to follow a specific color theme or have a playful image as a dance floor vinyl decal, Bombshell Graphics is here to transform the entire appearance of your event with our custom dance floors and dance floor wrap. Our custom dance floor covers really add that extra element of functional decor that is perfect for everything from a wedding to a Bar/Bat Mitzvah to a birthday party or other social gathering. We can create a special custom wedding dance floor or make dance floor decals that highlight your particular celebration. No matter what type of dance floor decal or custom dance floor graphics that you decide on, you will be more than pleased with the results! At Bombshell Graphics, we aim for perfection with our custom dance floor wrap products. We make sure all of our dance floor wraps are fit for perfection because we understand the importance of your special event! Let us create the dance floor wraps, vinyl floor wrap, and custom dance floors of your dreams! The custom dance floors created by the team at Bombshell Graphics are not just high in quality but they are also admirable. The more custom graphics, vinyl dance floor wrap, and dance floor stickers that you see made by Bombshell Graphics, the more you will want to continue turning to our team for all of your custom designs and custom vinyl wrap printing. With the help of a trusted company like Bombshell Graphics offering dance floor graphics, you won’t have to worry about making the venue look enticing because our cool floor graphics do the job all on their own. Even when you opt for special custom dance floor wraps and vinyl dance floor wrap, you can rest assured that your design will be vibrant, detailed, and attractive. Make your event special with the best dance floor wraps and custom printed vinyl wraps from Bombshell Graphics. After all, we are the professionals and want to make your event most memorable with our custom vinyl wrap printing services. Even if you are looking for floor graphics in Washington DC or floor graphic printing in NYC, Bombshell Graphics can produce the best floor graphic designs for you because we cater to those throughout the Northeast! The reason that our personalized floor clings and vinyl floor graphics are so ultra popular is because of the care and craftsmanship that goes into them. They are not mass printed but custom crafted for each specific custom floor graphics printing request. Our designers and printers are top-notch and every custom floor graphics product is a big hit that keeps guests talking for weeks. Regardless as to the type of custom dance floor, wedding decor, or personalized floor clings that you need, Bombshell Graphics can do it all! It is because of our precision and creativity that we are able to create such remarkable custom floor graphics, including vinyl wrap dance floor, custom dance floor decals, and dance floor stickers for events. Bombshell Graphics is simply the greatest floor graphic and printing company in NYC, New Jersey, and the entire East Coast! So no matter where you live or where your event will be, you can trust in the quality of our custom printed vinyl wrap, custom floor decal decorations, and floor stickers for events! From our custom dance floor wraps to our special custom dance floor decals to our general dance floor decor, you can have the event you have always wanted. Let us take care of everything design and graphic related! Not only are our floor graphics high in quality but the floor graphics pricing is also cost-effective so you don’t have to burn a hole in your budget! No matter where you are located in the Northeast or what your budget is, Bombshell Graphics is here to provide the best floor graphics at the best pricing options! 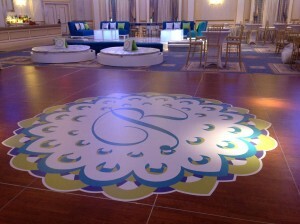 One of our most popular custom dance floors and floor graphics options includes the monogram wedding dance floor decal. There is simply nothing quite as lovely to add to an already exquisite event than a dance floor monogram decal for the reception or wedding decals for the dance floor to commemorate specific memories or meaningful symbols representative of the sacred union being performed. Our vinyl floor decals including our wedding floor decals and the monogram wedding dance floor decal are available in a variety of sizing and custom vinyl graphics options. In fact, custom floor decals are becoming more and more popular at weddings and special event simply because you have the ability to personalize them. Every bride and groom wants to have their wedding look as special as it should be. That’s why having a memorable monogram wedding dance floor decal can make all the difference. Bombshell Graphics does exceptional work, especially when it comes to creating and installing monogram wedding dance floor decals. We truly want to help enhance the appearance of your venue and make your Big Day one you will never forget! Weddings are truly wonderful, so all the custom floor decals and floor graphics should be too. Whether you prefer a specific monogram wedding dance floor decal or custom floor decal that puts emphasis on the colors of your event, Bombshell Graphics is here to create the environment of your dreams! You just won’t find any better monogram wedding dance floor decal at any other company! When you want to have that luxurious, beautiful wedding, you turn to the best, so don’t waste your time with any other graphics or printing company. Bombshell Graphics is the leader in the industry for a reason, and it’s because of the way we create a vinyl dance floor for weddings, wedding floor decals, and dance floor monogram decal options. The team at Bombshell Graphics is committed to helping you make your wedding extra special. Whether you choose a special, intricate custom dance floor decal for the venue where your reception will be or one of our unique wedding dance floor decals for extra glamour, you will be overjoyed at how well our designs tie the entire room together. Bombshell Graphics truly wants to highlight your special day by making sure all decor printing and graphics are created and set up in excellence. This is what truly sets our custom graphics and printing company apart from the competition – we truly care about how your special event will look. We aim to please you with our leading custom floor graphics, vinyl dance floor wrap, personalized dance floor decal, and dance floor stickers for events! Find out more about our custom dance floor graphics. From artful decor to wall hangings to custom printed coverings for any decorative element, we can turn anything into a work of art that gives a custom feel to any theme and really brings the pop to your party or event. Bombshell Graphics truly wants to create your dream event with our unique vinyl floor wrap, floor branding, personalized floor clings, vinyl floor decals, and custom vinyl wrap printing service. High quality event decor printing adds that extra aesthetic element that is often the difference between good and great, between “Looks nice.” and “Wow, this looks amazing!” We make great efforts to transform venues into masterpieces by using the best methods for decor printing and strategical placement to tie the room together. From the custom floor decal to custom floor stickers to the elaborate dance floor decal, all of the pieces that are created by us and used in the venue come together to intensify the appearance of the venue. We are happy to suggest options or take any of your requests and transform them into perfect complementary pieces based around your colors, themes, designs, or suggestions. Bombshell Graphics wants to make sure you have the best event decor and we cater to your specific needs, which is why we offer custom dance floor decals, custom monogram wedding dance floor decal, custom floor stickers for events and more! Make your event special with custom floor stickers, personalized floor clings, vinyl floor wrap, and more! We specialize in helping you create a special and original occasion like never before by branding everything and anything with your unique design. From floor branding to custom floor decal and more, Bombshell Graphics is here to transform your space into a magical place! Whether you need event décor in NJ, Connecticut, Pennsylvania, or anywhere else up in the Northeast, you can depend on Bombshell Graphics. There’s just nothing like high quality event and dance floor decor from the best in the business. From each votive in your centerpiece to having your name or design on the front of every pillow in the room, we are the company that can make your dream event become a reality. Read more about our Event Decor Printing. Out with the old and in with the new! Forget about the hassle of wall paper when trying to customize your house or business. Now with custom wall graphics from Bombshell Graphics, you can recreate space to your liking! From creating the design of your dreams to the fast and efficient install of your image or mural, we help you every step of the way with our wall graphics printing services. Wall Graphics In the Office: For business owners, wall murals and wall monograms are the perfect way to promote your brand in a new and innovative way. Similar to floor branding, wall branding and custom wall graphics allow you to transform your office according to your own business concept, logo, and theme! Whether you decide to install your logo in the front entry or have an image of bold colors covering every wall in the building, our vinyl wall graphics and custom wall decals are a sure way to attract attention and add stunning decorative elements to complement any environment. But it doesn’t have to be bold marketing as a simple textured design on vinyl wall graphics can replace boring paint in any space and give you a clean and subtle feel or any other emotion you are going for. So whether you want entirely advanced advertising graphics or subtle wall branding, Bombshell Graphics is here to bring your office to life. Wall Graphics In the Home: These wall graphics are also great for decorating the home! From small quotes on your living room wall to your child’s favorite superhero flying across the ceiling, our vinyl wall graphics are guaranteed to take your imagination to the next level. Because of our installation methods, there are NO SIZE LIMITATIONS to our wall graphics. And there are never any creativity limitations. We strive to provide the best options for vinyl floor decals and that is exactly what we do. We want you to have the most exciting options and to bring your own ideas for a monogram dance floor decal to life. Whether you need a monogram wedding dance floor decal or your own custom vinyl floor decals, Bombshell Graphics is ALWAYS the answer. No matter what type of wall graphics you get, whether they are custom wall graphics in the home or vinyl wall graphics in the office, you are sure to be satisfied with the finished project. Learn more about our Wall Graphics and Decals. The same graphics that you currently use in banner advertisements and window graphics, can easily be translated into bold and effective floor graphics. Bombshell Graphics offers a variety of unique custom floor graphics, custom dance floor graphics, dance floor stickers, and custom floor decals. 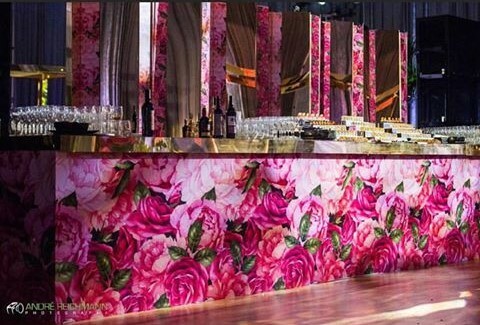 Whether you are trying to emphasize a theme for an event or add an elegant touch for a special occasion, our floor graphics can entirely change the room. These design elements take up less space than a sign and utilize your existing floor space while maximizing advertising efforts. So you can decide if you would like to have a custom floor decal of a logo, name, or phrase to highlight a key concept of the event. As a leading vinyl wrap printing service, we have high quality custom vinyl that we use for our cool floor graphics which makes them weather resistant and well-tolerated for both indoor or outdoor use. And you don’t have to worry about all that foot traffic because our small and large format vinyl graphics are laminated and durable so that your custom floor graphics and creative floor stickers last for the long haul. There simply is no substitute for the look and feel that floor graphics can create on an environment, whether for aesthetic purposes, wall and floor branding, event decor, or as a custom dance floor. Read more about our Floor Graphics Printing. Our digital wide format printing services are available for a range of materials including vinyl, paper, banner materials, and more. At Bombshell Graphics, we believe in working around your specific needs, which is why we extend our large format vinyl graphics and vinyl wrap printing service to allow for custom vinyl stickers, custom printed vinyl wrap, custom window graphics, custom wall graphics, and custom floor graphics. Images attract customers and we can help you strategize the best location for a large format image or sign as well as help hammer out that perfect design. We know that wall and floor branding is important, so whatever size or length you require, Bombshell Graphics is here to satisfy your needs. Whether you want a printed dance floor, decor printing, floor graphics printing or some other wide format vinyl printing services (or standard materials wide format printing services) we have the equipment and expertise to handle every scale of project quickly and efficiently, producing high-grade results that you will be proud to showcase. For example, here is our latest beauty, an award winning Roland LEJ-640FT wide format printer, which enables us to print on almost any material. Bombshell Graphics uses high quality technology to help create the custom graphics you need! The best normal wide format printers can handle paper, flexible plastics, and if the printer is a high enough grade, vinyl, canvas, and textiles. Our new Roland printer can do all of that and take it to the next level, having no difficulty with handling thick plastic, boards, glass, wood, metals, and so much more. The wide format vinyl printer we have is simply top of the line equipment. This flatbed UV printer delivers options for unparalleled printing capabilities with the widest range of substrates, including heavy, rigid materials up to six inches thick and weighing up to 220 pounds. Best of all, the printer adds white and clear coat ECO-UV inks that absolutely pop, enabling spectacular works of art, clearly defined design aspects, beautiful promotional elements, and unique dimensional effects. So not only can you print on just about anything, enabling you to customize any material you want, but it will look flawless. All of the custom graphics from Bombshell Graphics are created carefully and exact because we know precision and appearance matter. Using the best quality printers, tools, and equipment is a critical component for the best custom vinyl graphics so we make sure to have the best materials on the market. From dance floor decals to large vinyl floor decals to custom window advertisement printing to wall graphics in New Jersey, New York, Connecticut, and the Northeast, Bombshell Graphics has you covered with the most beautiful and versatile graphic options! Learn more about our Wide Format Printing services. Bombshell Graphics specializes in outdoor and indoor signage including custom signs and banners, vinyl signs of all sizes, and vinyl banner printing to meet all your marketing or business needs. We want to help you put emphasis on your business and brand with our custom advanced advertising graphics and wall branding. Custom banners are a great way to promote new products and deals, and they are easily retractable/portable to use for specific time frames or take on the road to promote your company in multiple locations and venues. Banners come in such a large variety of size options and personalized graphics that we would be happy to discuss your exact signage needs and do everything we can to help optimize your space and advertising requirements. There’s no greater company to turn to for indoor and outdoor custom wall branding, floor branding, advanced advertising graphics, custom window advertisement printing and personalized store window advertising printing services than Bombshell Graphics! We are dedicated to making your business and key concept known with our custom graphics. Our high tech wide format vinyl printer will allow us to design on a variety of substrates and surfaces, enabling us to create unique signs and banners on a variety of materials that give your branding a look and feel that is simply priceless in a world where standing out is half the draw. Check out our Signs and Banners services today! Storefront graphics are extremely flexible for customization and often essential for promoting your physical business location or brick and mortar storefront. Eye-catching custom window decals and vinyl window graphics create a dazzling effect that is the first step in attracting a wider customer base from passing foot or car traffic. We can help create images to fit any available space requirements, and our store front window graphics are perfect for every location no matter the existing dimensions or restrictions. Whether you want a window frosted for complementary effect (or the added mystery of greater in store privacy) or a fully enlarged marketing image advertising your business, we can produce these highest quality products for attracting new customers and improving the visual and aesthetic quality of your business location. 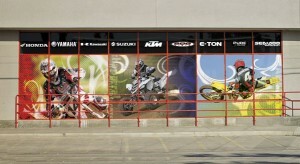 For the best personalized store window advertising printing, Bombshell Graphics is the answer. We strive to provide the best custom window advertisement printing services because we want to help you have the most attractive, inviting, and desirable signage for a successful business. From innovative storefront window graphics and personalized store window advertising printing services to advanced advertising graphics, Bombshell Graphics proves to be the best custom graphics company for marketing. Click the link for more information about our Window Graphics. We bring your images to life by enlarging the print of your choice to enhance any event, business, or personal decor. Our most common photo enlargements include laminated or mounted prints. Although the possibilities are endless, some of the materials we can print on include foam board, acrylic and aluminum. Mounted prints come ready to hang in any space while our basic prints can be placed in, on, and around anything. So when you need custom photo enlargements or standard photo enlargements, don’t hesitate to give us a call or contact us through our website form and we will be happy to provide a highly competitive price and fast turnaround time. Bombshell Graphics is built on a philosophy of dedication to our customers. We truly want to cater to any and all of your custom graphics needs, including incorporating personal pictures and adjusting custom photo enlargements. Read more about our Custom Photo Enlargements. Our custom stickers and floor stickers for events are a fast, cheap, and easy way to promote your business. We can do everything from decorative and bumper stickers to wine bottle labels. Anything you want printed can be made into a sticker and custom cut into any shape. Custom vinyl stickers are popular because you can have whatever design, shape, picture, or words that you want brought to life. These custom floor stickers and wall stickers can transform events, businesses, offices, and any location! And not only standard stickers, we also offer a variety of custom vinyl stickers, wall stickers for special occasions, and floor stickers for events. These can make your event pop, and in particular spots too! No matter what type of vision or design you would like to convey with the use of special stickers and floor stickers for events, you can trust in Bombshell Graphics to provide exactly what you want! Even if you are looking for discrete dance floor stickers or large format custom floor stickers to cover specific areas on the ground of your venue, Bombshell Graphics is here to make magic happen. Whatever your sticker needs, we can produce them quickly and efficiently, at a higher grade than other print shops or custom graphics company. Whether you are looking for floor graphic printing in NYC or special custom floor stickers in New Jersey, Bombshell Graphics is the company to turn to for assistance! Read more about our Custom Stickers today!